Sam Kittner About 15 years ago, David Ashworth, a systems engineer at the Applied Physics Laboratory, was walking through a park in Connecticut when he encountered someone flying a kite. The kite was a two-line sport model, which meant its owner could make it turn and dip and perform various aerobatic maneuvers. Ashworth thought, I'd like to try and make something like that. He found a book on building kites and assembled his first, which he remembers was not all that good. "But over time I learned," he says. Indeed. Last year, Ashworth won a first prize in kite building at the annual convention of the American Kitefliers Association, held in Ocean City, Maryland. Sometimes he competes in what is known as "ballet," in which he flies patterns in the sky to music. He enjoys flying indoors, with special kites so lightweight he can loft them by simply walking about. 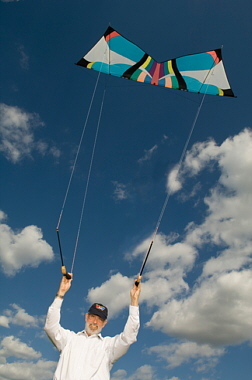 Ashworth has had heavier kites, designed for high winds, lift him from the ground. There is a subset of extreme fliers who do that sort of thing on purpose, but, says the 62-year-old engineer, "that is a sport for people who are young, not my age."